GlobalPort Batang Pier owner Mr. Mikee Romero seems to be 100% serious when he said that he wants GlobalPort to be better as soon as possible. A new trade rumor involving GlobalPort has been divulged. This time around, they are allegedly looking to trade for the High Flying Warrior Elmer Espiritu. 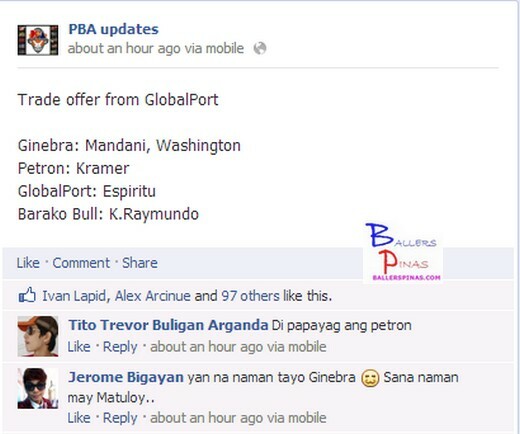 The rumored trade offer from GlobalPort looks like this. Ginebra will get Mandani and Washington. Petron will receive Doug Kramer. GlobalPort will acquire Elmer Espiritu and Barako Bull Energy will get Kerby Raymundo. Again, this trade rumor is not yet approved. The Commissioner can either approved it or veto it, depending on the circumstances involved.